Posted by: Mambaon 2013/3/5 11:20:00 21091 reads It's time to finalize our Module Packs. 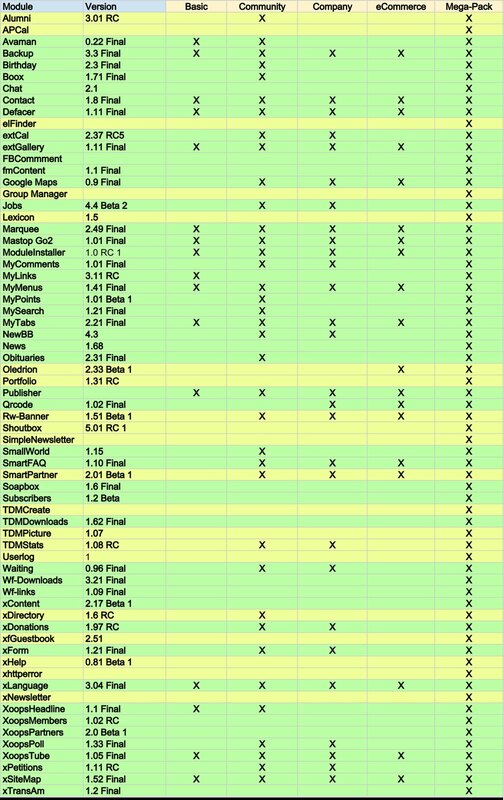 In Green, modules that are tested and released. In Yellow, modules that are still being worked on, and if they're finalized on time, they will be included. I am sure, that we've missed some modules, or some modules might be duplicate, and should be removed. Some modules might be not in all appropriate Packs. If you don't know some of these modules, you can find descriptions for most of them in this article, or in the "XOOPS Resource Book"
Please let us know what you think in this thread. Good news. XOOPS begins to move again. May I know who is the main developer of the module OLEDRION? What are the prospects and timing to see the final version of this module? I'm missing "tell a friend". Version 1.05 has problems in admin section of xoops 2.5. Does someone have a working version for xoops 2.5+? In the next version of xoops 2.6.0, the module tellafriend will be transformed into an extension or even a plugin that opens a popup on the user side. Version 1.05 has problems in admin section of xoops 2.5. What kind of problems? What PHP version? Feichtl, I've updated the "tellafriend" module to XOOPS 2.5.6. With extGallery 1.11 I don't have any problem. Thank you, Michael - works fine now! Thanks for this update, Is there a zip folder with all these modules? At the moment Where can i download NewBB 4.3? I have searched almost everywhere and i need a stable forum. What errors are you getting? What PHP version do you have? Just a blank error page from Chrome. Nevermind, solved. Simply I was pasting the folder fmcontent inside the htdocs instead of the xoopslib folder sited in the root!